← Watch Video Teaser! 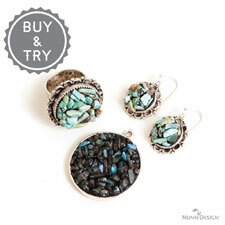 Open Back Bezels with Colorized Resin and Organics! 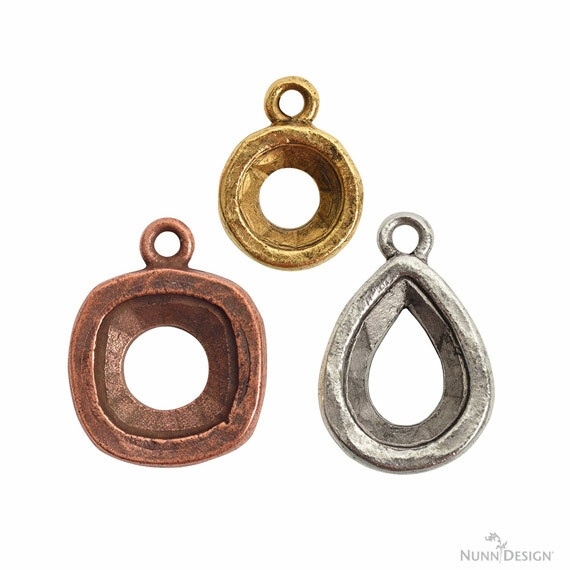 This class, Open Back Bezels with Colorized Resin and Organics, features the organic styled open back bezels from the Nunn Design Findings Line. 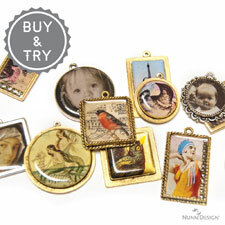 Explore creating your own style with this technique involving colorized resin and dried flowers! 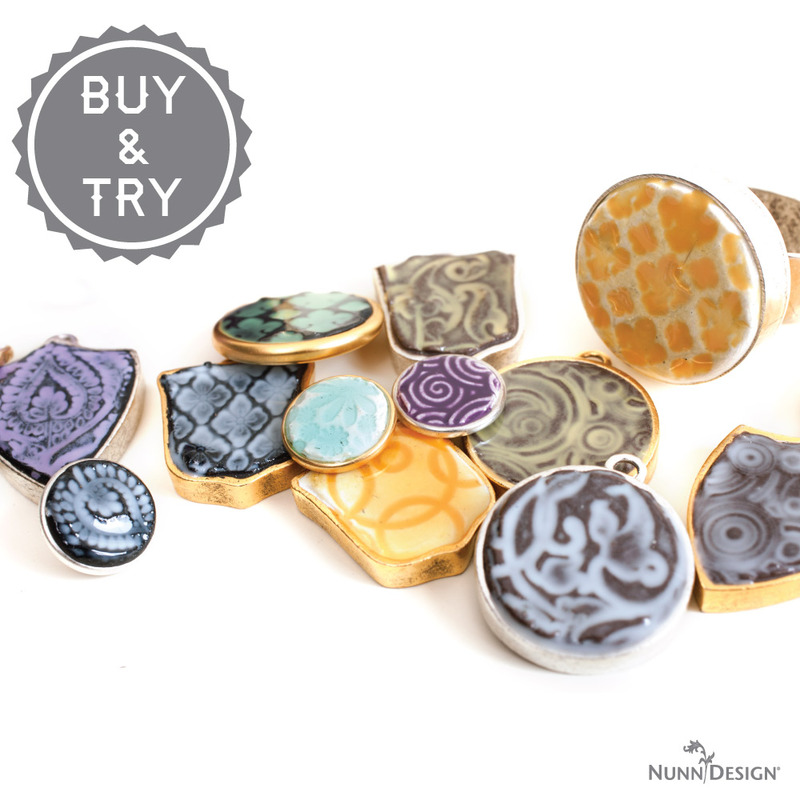 The Buy & Try Open Back Bezels with Colorized Resin and Organics feature the organic styled bezels from the Nunn Design Findings Line. 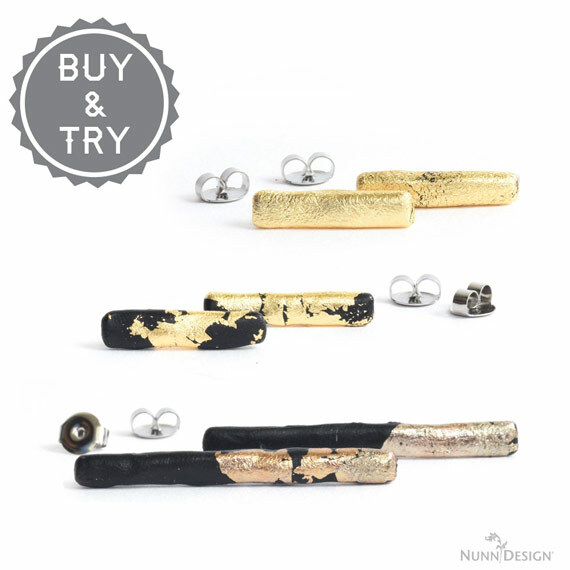 Bezels are cast in lead-free pewter and plated with copper, 24k gold and .999 fine silver. 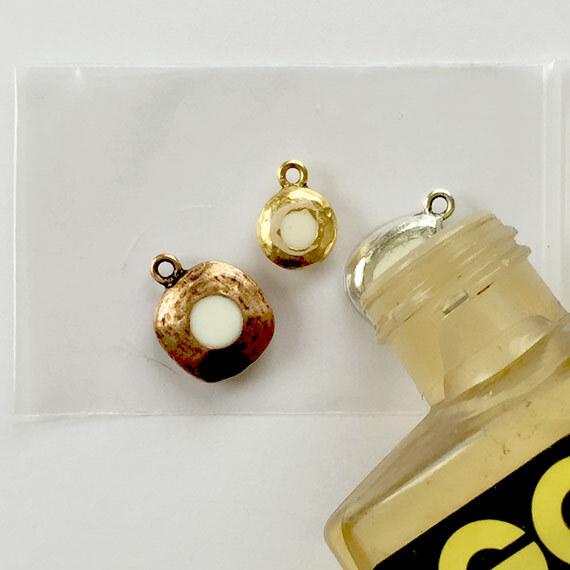 All of the other supplies needed for this technique are also available in the Buy & Try Open Back Bezels with Colorized Resin and Organics. 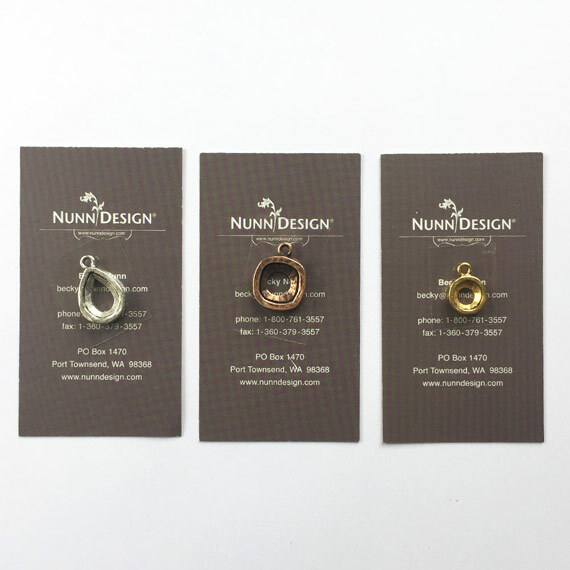 Findings are made in the USA. 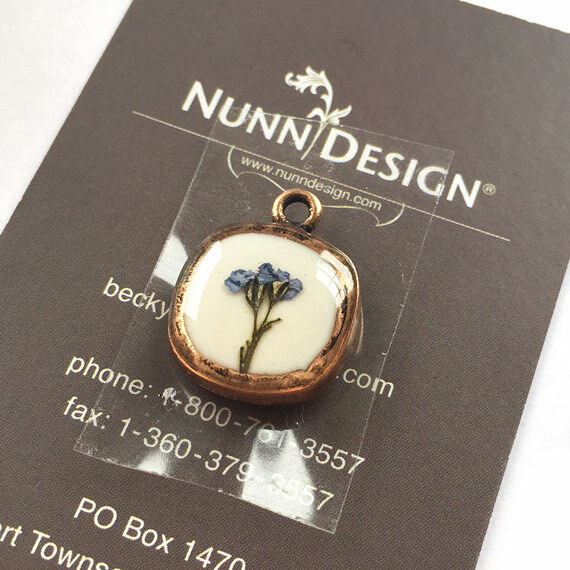 To ensure that your dried and pressed flowers are ready for resin, please read a previous blog post that covers several great tutorials on How to Dry and Press Flowers to Embed into Resin. 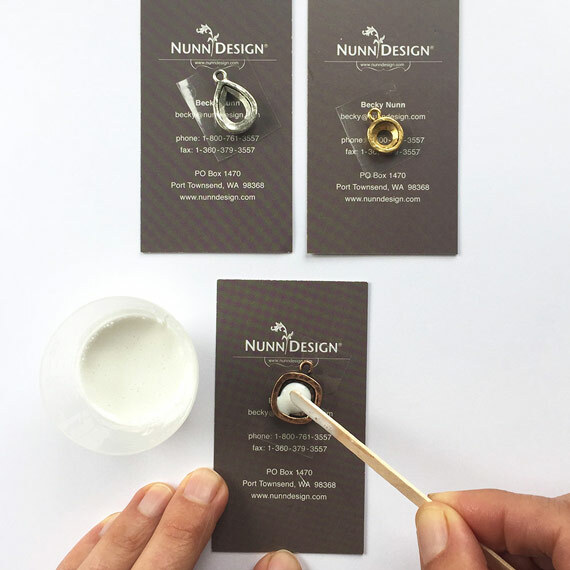 The preparation of drying and pressing of your flowers is a critical step for avoiding bubbles in your resin. 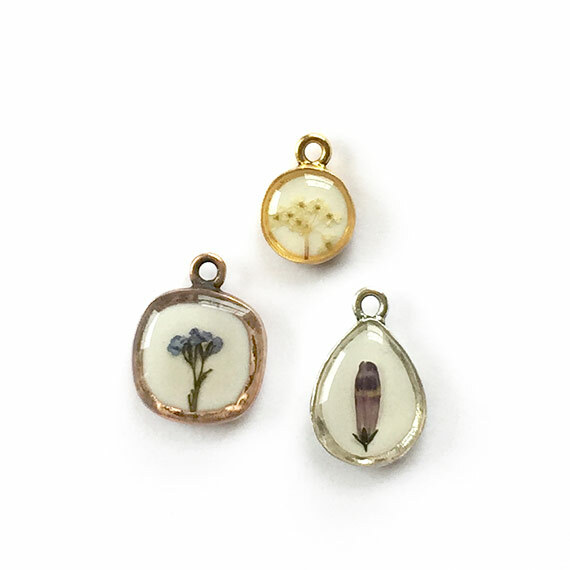 Some dried and pressed flowers will become totally translucent when exposed to resin. If you want to reduce your risk of this happening, you may want to get in the habit of spraying Castin’ Crafts Resin Spray on all your flowers before embedding them into resin. 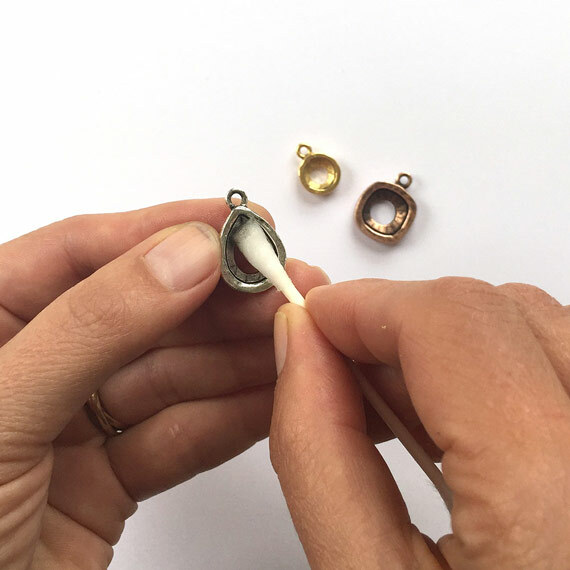 The resin spray is very fast drying, easy to apply and will seal your dried and pressed flowers nicely. Place dried and pressed flowers in a cardboard box with high sidewalls and head outside when it is time to spray. Spray the dried and pressed flowers on one side, then turn over and spray the other side. 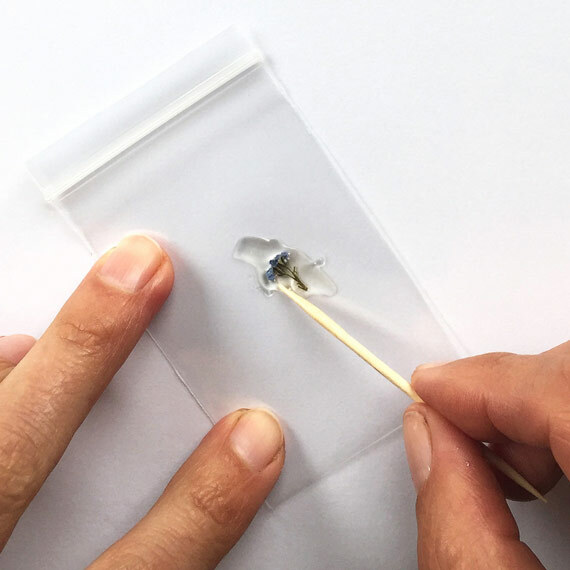 If you don’t want to go this route of purchasing resin spray (sorry, it is expensive for us to ship this, so we don’t offer it on our site), you can have some extra dried and pressed flowers at the ready in case the flowers that you wanted to use become translucent and aren’t working for you. 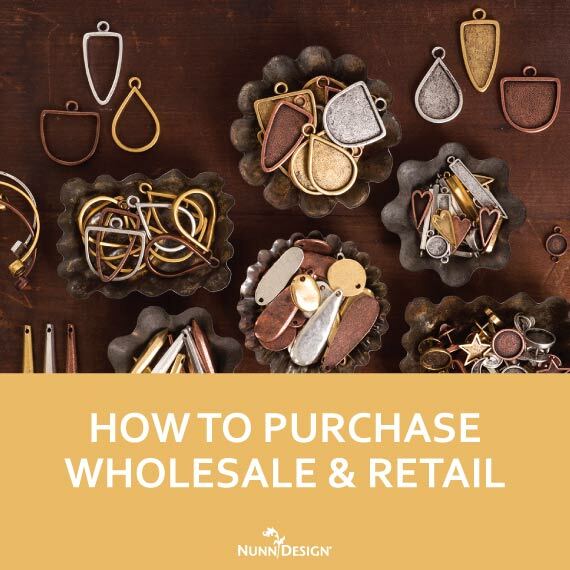 Because there are a gazillion options for flowers (well, maybe not that many) it is way too hard to know what will work for sure and what won’t. You will have to experiment. TIP: This vendor has free shipping on Amazon. 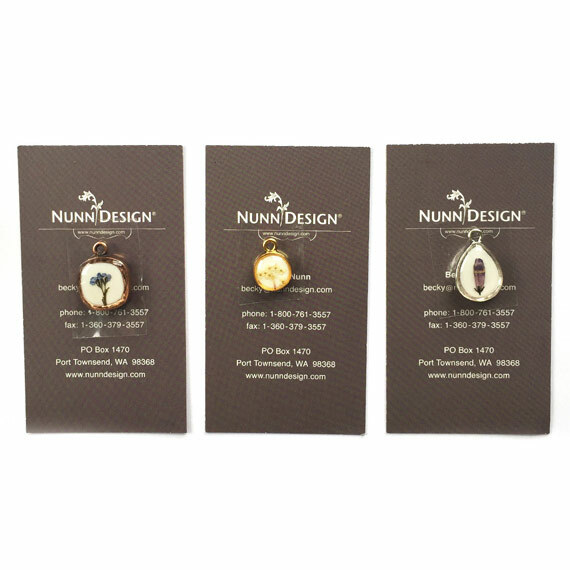 Lay out the various Nunn Design Open Back Bezels and the organics you would like to work with onto your work surface. 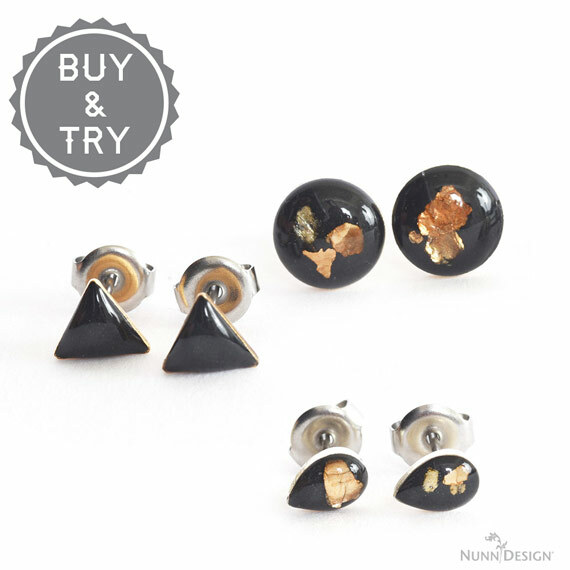 Select flowers and organics that will work best with the various sizes of the bezels. 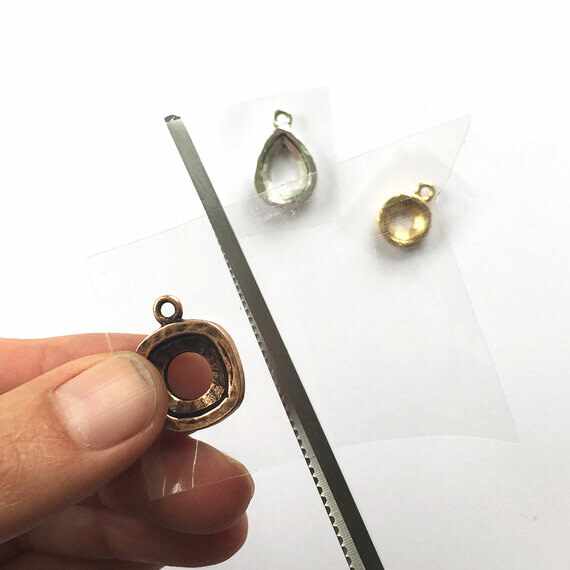 Use a pair of flush cutters or scissors to cut away any organics to prevent any overhang off the side of the bezel. TIP: Work with organics that are pressed flat. If the height of the organics is too high, the resin won’t be able to “dome” over the top of the organics and the organics will protrude out the top. 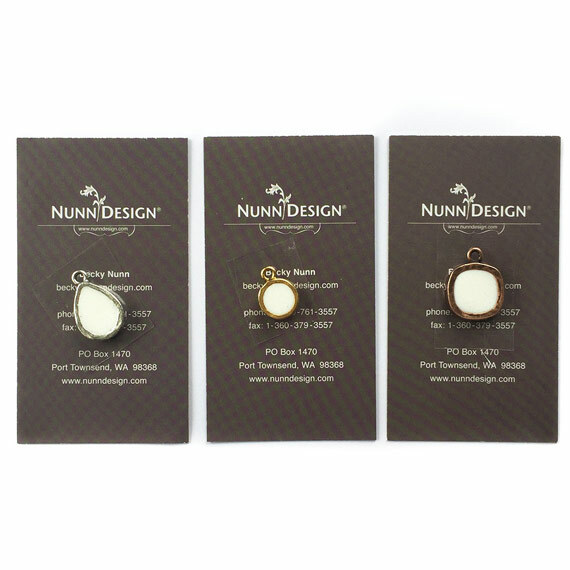 The Nunn Design Bezels are oxidized to provide the antique look to the precious metal plating. 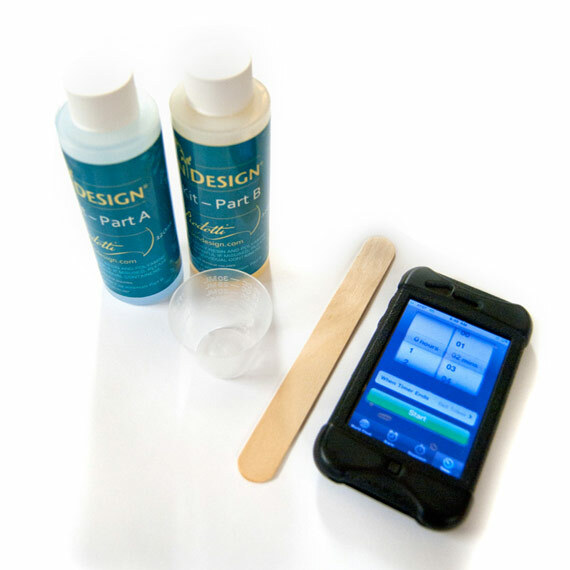 The oxidization, when it comes into contact with the resin, could change the color of the resin. 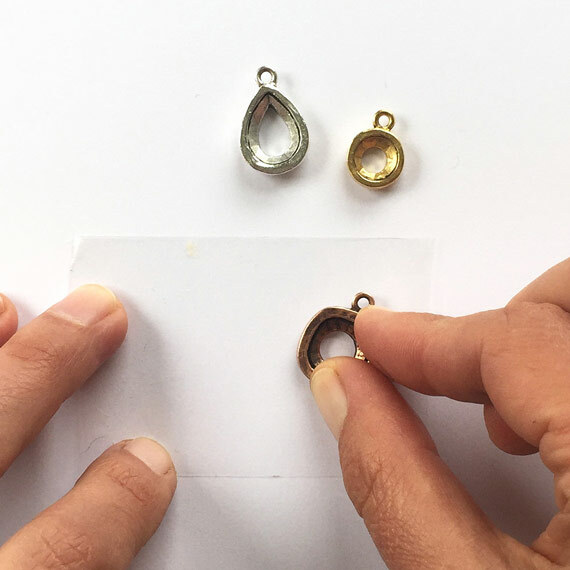 To avoid this, clean the bezels thoroughly prior to application of the resin. 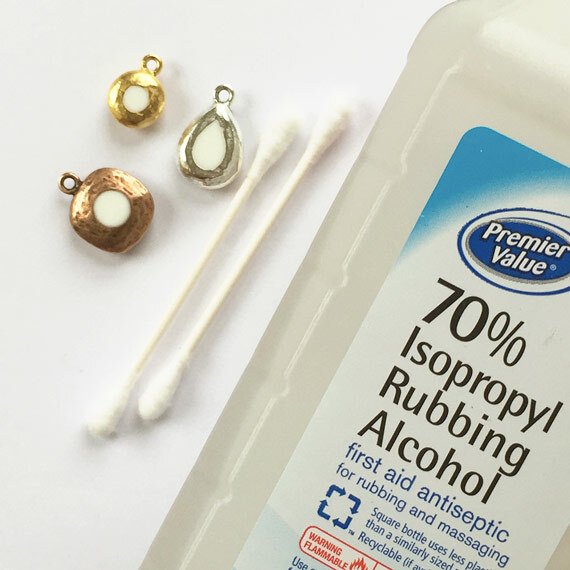 Dip the tip of a Q-Tip into rubbing alcohol and clean away any of the blackened oxidization from the tags surface. 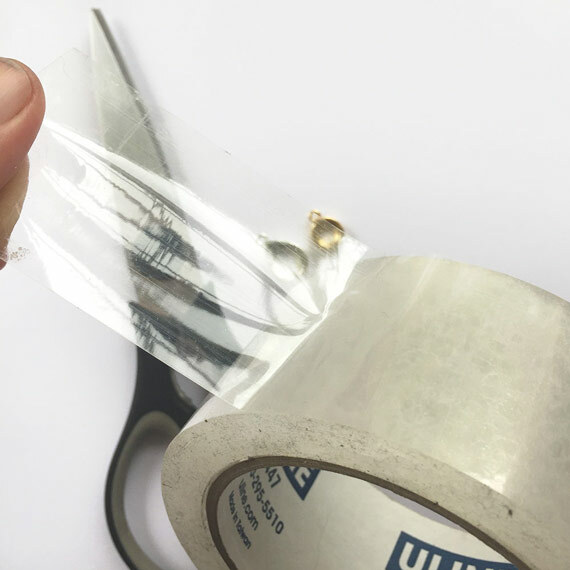 Cut a piece of packing tape and place it sticky side up on your work surface. 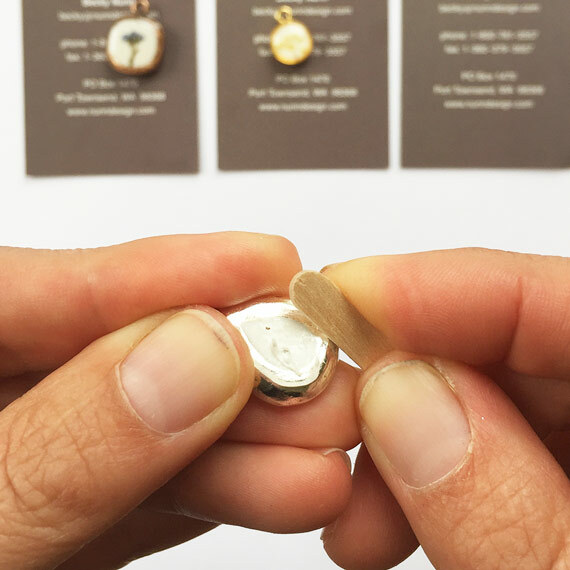 Place an Open Back Bezel onto the tape (backside down). 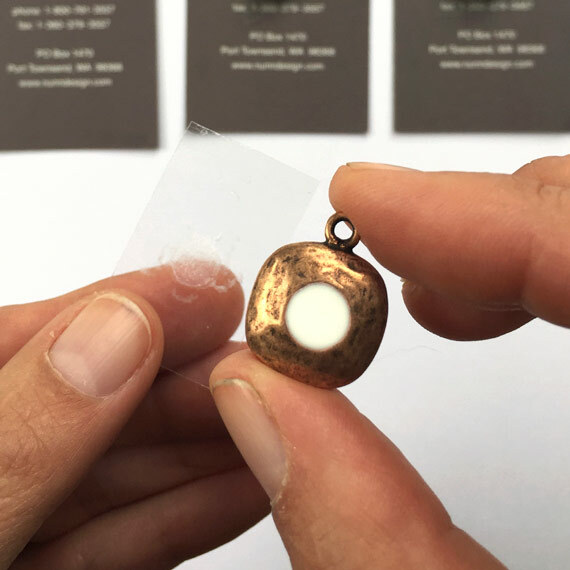 Using your fingertips, press the bezel down onto the packing tape and rub back and forth on your work surface to make sure it is burnished down. 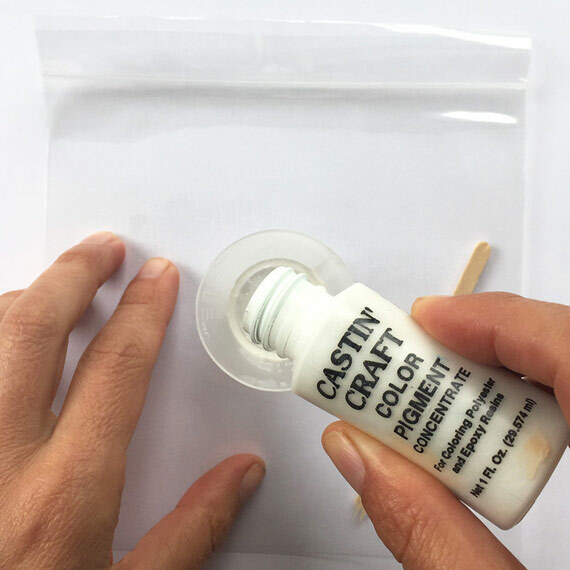 Tip: Check to see that your packing tape is clear and there is no residue or mottling in the adhesive. 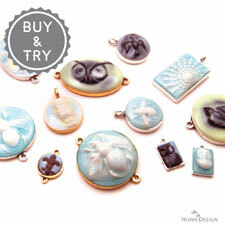 If there is, it will show up in your finished resin piece when you remove the tape once the resin is cured. Try to use an area of the tape that does not have blotches or marks. 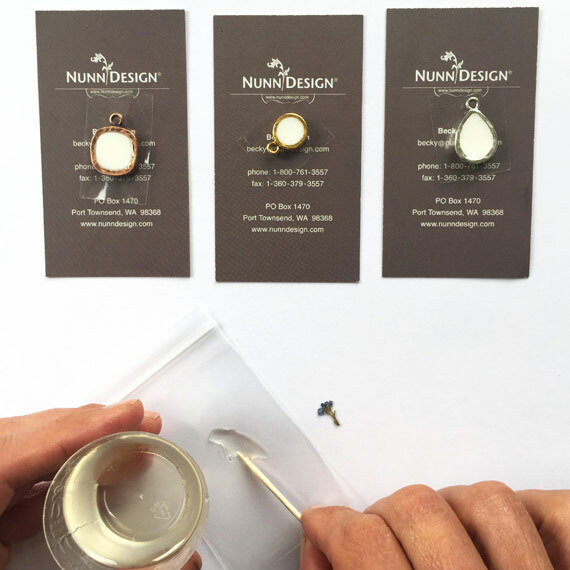 Trim away any excess packing tape from around your Open Back Bezel to avoid the curing resin piece from being potentially disturbed. 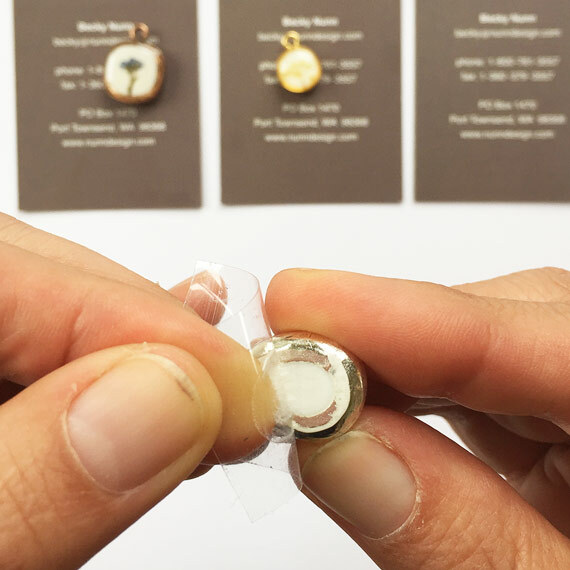 Tip: I like to place each bezel on its own individual piece of packing tape. It makes the pouring easier to manage and eliminates the chance of disturbing the bezel next to it. 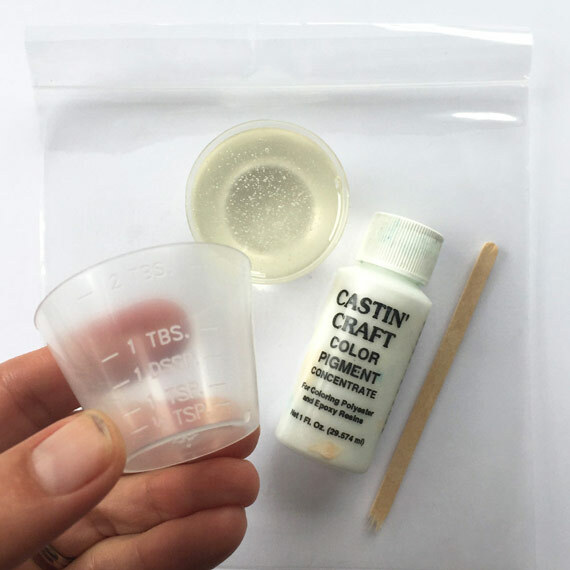 For this tutorial, I colorized my resin with Castin’ Crafts Opaque Pigments-White. To create Pantone Colors, take a look at this earlier pdf, 2017 Summer Pantone Color Cheat Sheet, to learn how to mix various pigments to achieve a variety of colors. 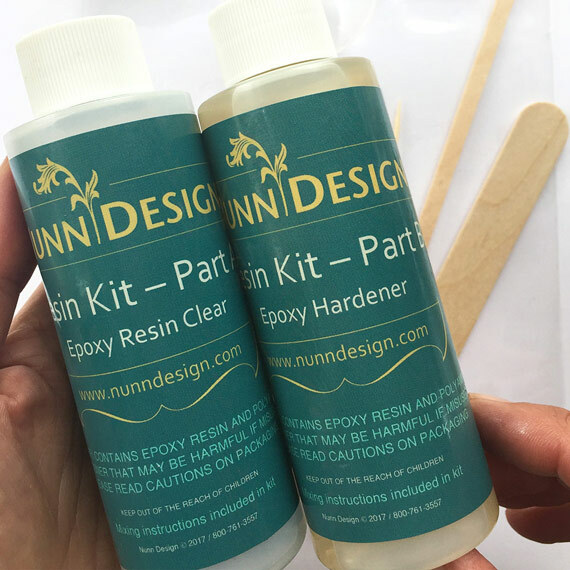 Place another empty resin mixing cup onto your work area. 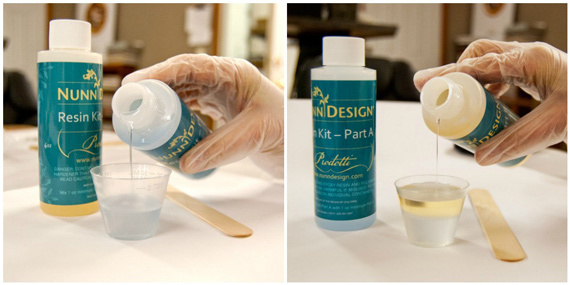 Pour the clear, mixed resin from Step 9, into the cup, filling it to the 1 tsp mark. Add in Castin’ Crafts Opaque Pigment-White. Stir gently until the colorant is fully mixed together. Let resin sit for 5 minutes to let the bubbles rise to the surface and pop. 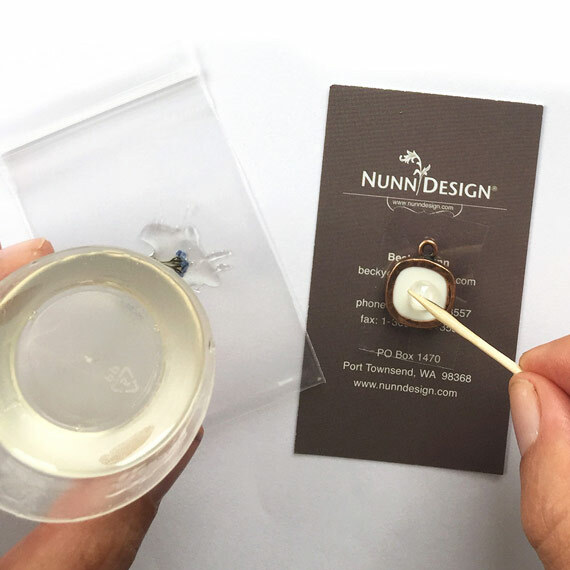 Slowly drizzle your mixed colorized resin into the Open Back Bezel until the base of the bezel is filled – but not completely full – you will want to have the colorized resin under-fill the bezel. 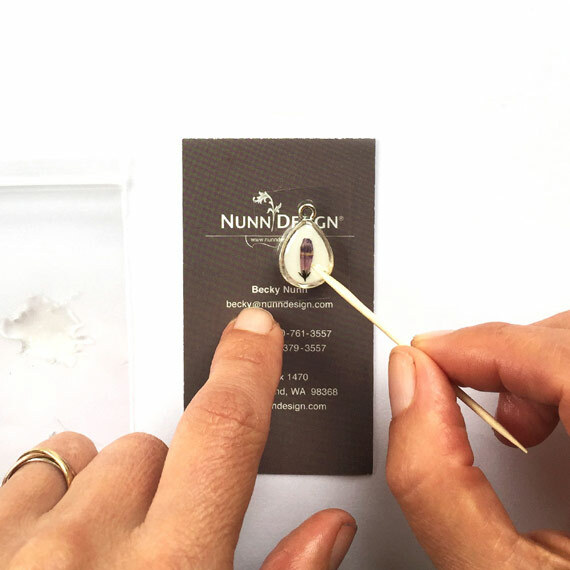 Use a toothpick to agitate the resin and make sure there aren’t any air bubbles lurking below the surface. 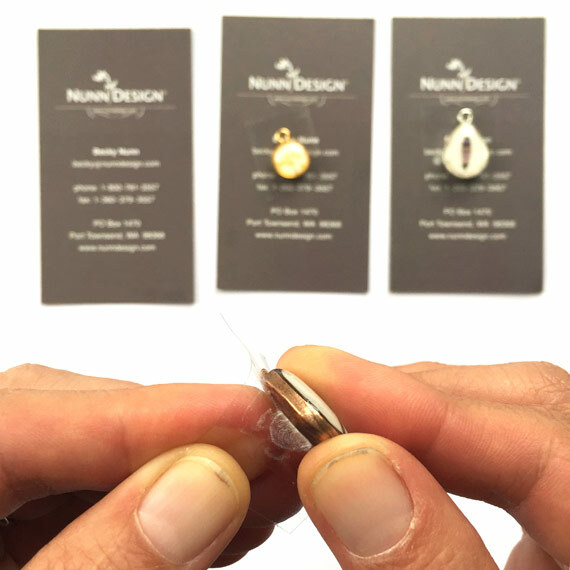 It is easy to have air bubbles be trapped in the base where the open back area is in contact with the packing tape. Make sure to run your toothpick along the inside edges to agitate any pending bubbles. After the resin has cured 12 hours it is time to add in your organics prepared in steps 1-4. 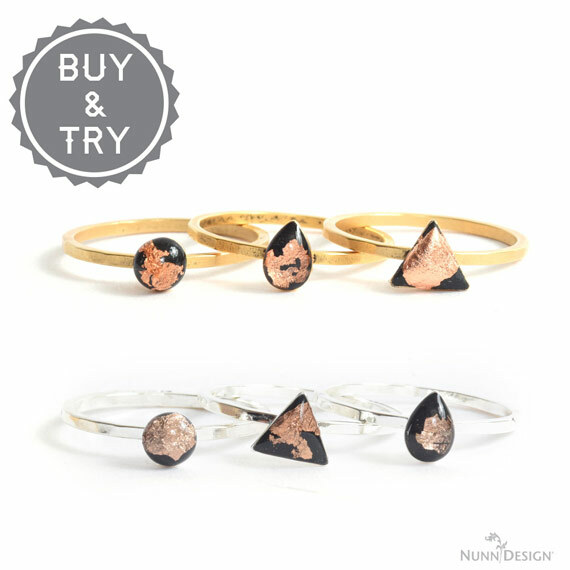 Follow Steps 9-10 for mixing another batch of clear Nunn Design Resin. 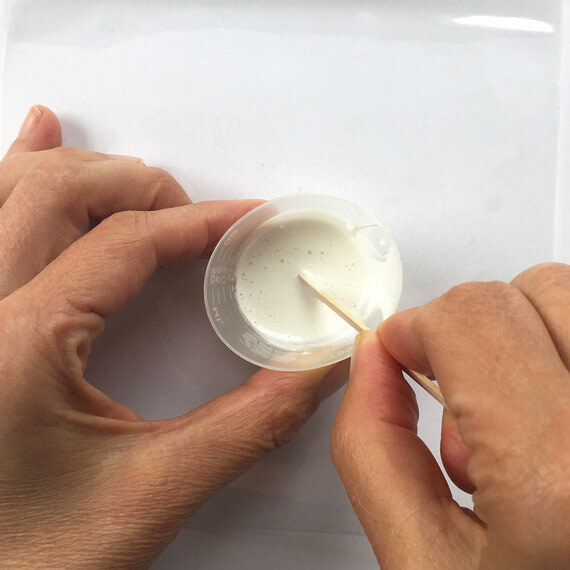 Once your resin is fully mixed, drizzle a small amount onto a plastic bag. 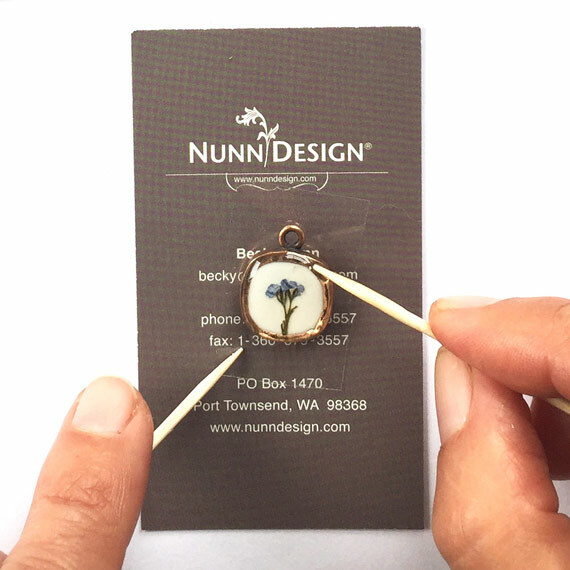 Use a toothpick or a pair of tweezers to place your dried and pressed flower into the resin, thoroughly coating the flower with resin on both sides. By doing this additional step, it helps eliminate some of the air bubbles that can get trapped in the many crevices of your flower. Drizzle a small amount of resin over the top of the colorized resin prior to placing the dried and pressed flower onto the bezel. This will provide a bed of resin for the flower to rest onto. I have found that this also helps with eliminating the chances of air becoming trapped. 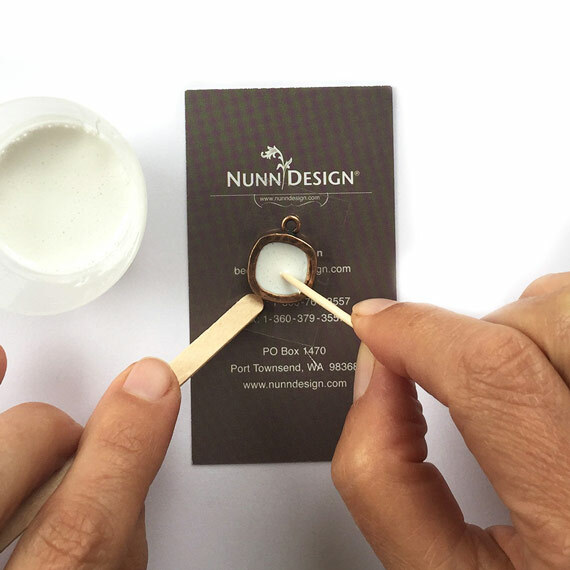 Use a toothpick to move the clear resin around on the surface of the colorized resin within the bezel. 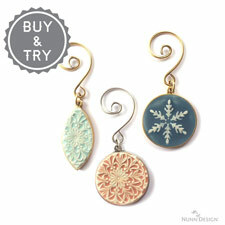 You are mostly interested in having clear resin be under the dried and pressed flower’s position in the bezel. 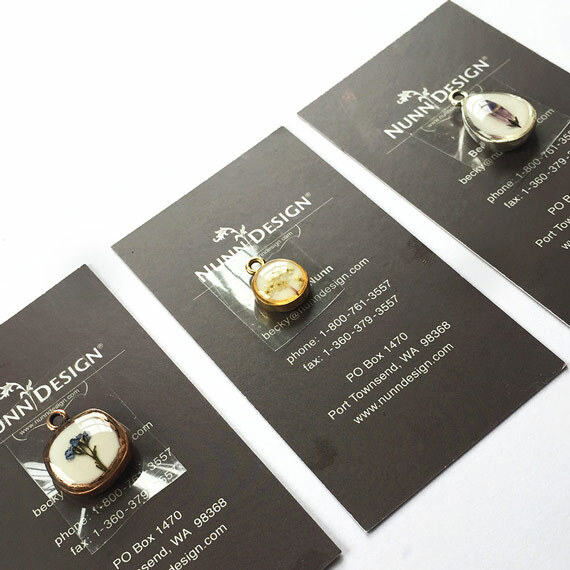 Place the resin drenched dried and pressed flower into the bezel. You can do this with a toothpick or pair of tweezers. 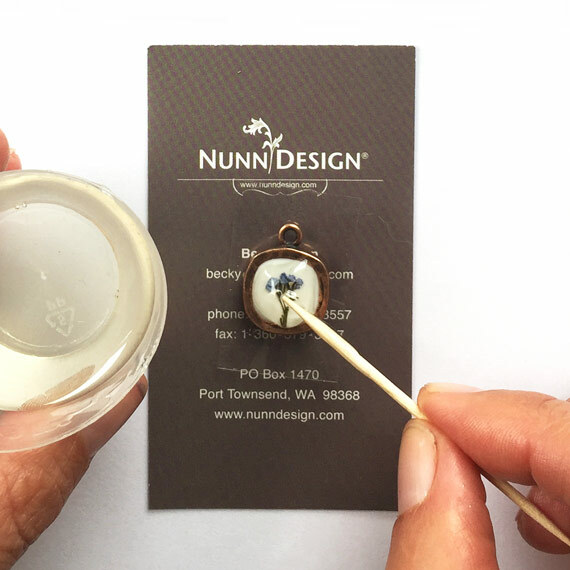 Once the flower is in the bezel, use a toothpick to move the flower around until they are positioned just as you would like them. Continue to poke and press the flower down into the resin, hopefully dislodging any potential air bubbles. 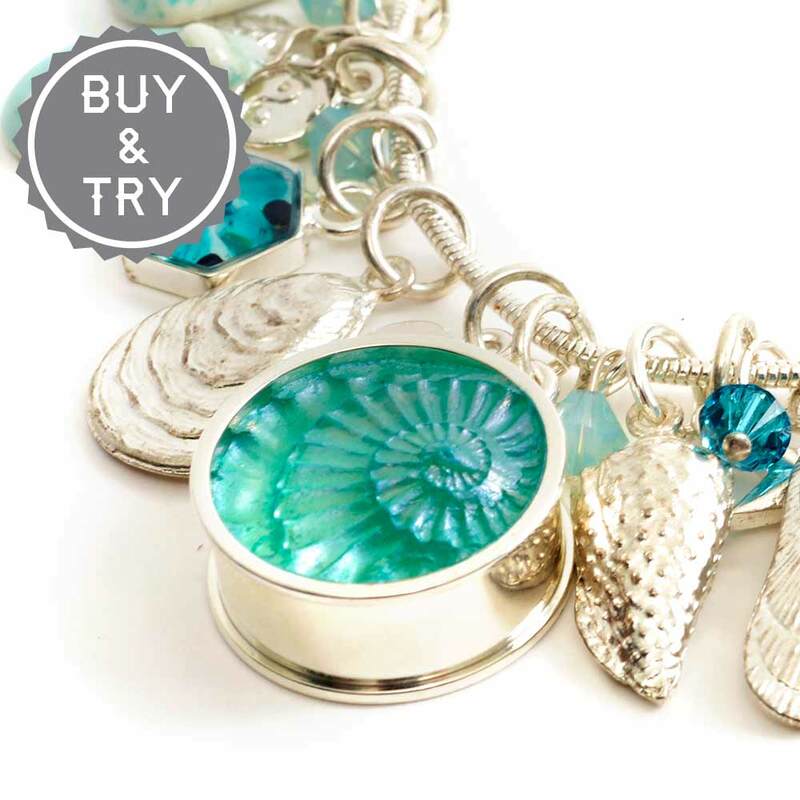 Once you have agitated your resin around the areas of the flower, drizzle more resin into the bezel until it is domed. 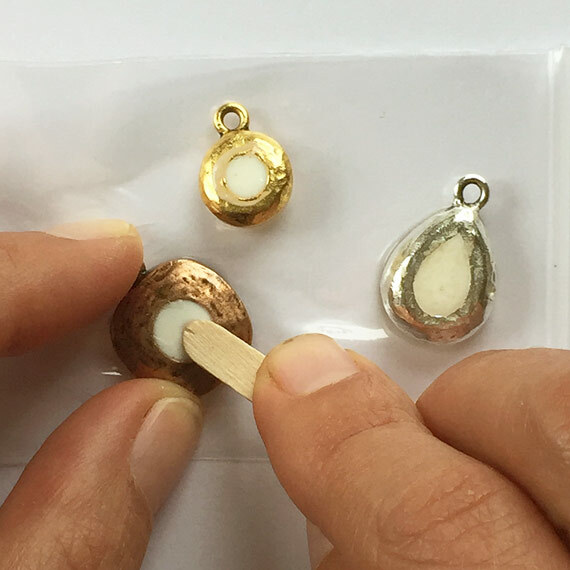 Use a toothpick to pull the resin out to the edges of the bezels. 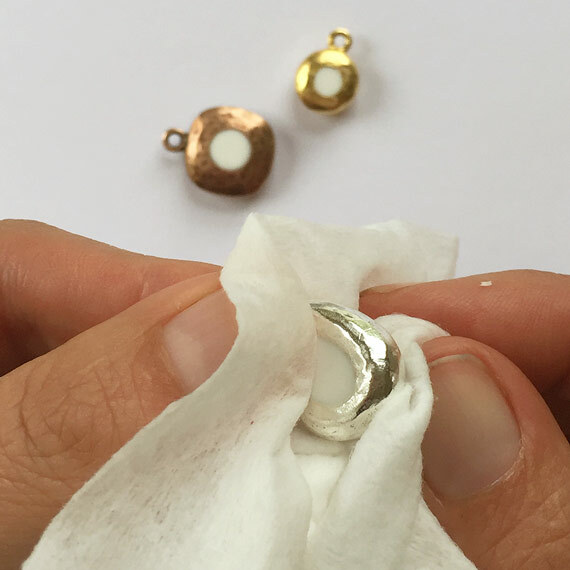 If you do have some overflow, let your resin filled bezel set for 12 hours. After 12 hours, the resin will be set, but still very flexible. Remove the packing tape. 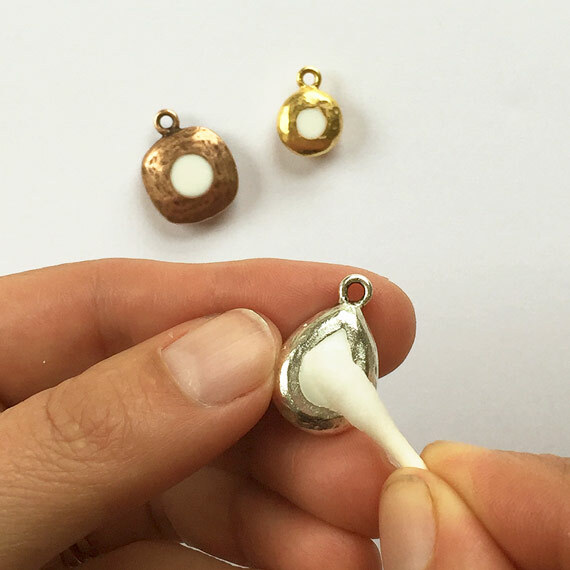 Use a pair of needle nose pliers to pry away the resin from the pendant. 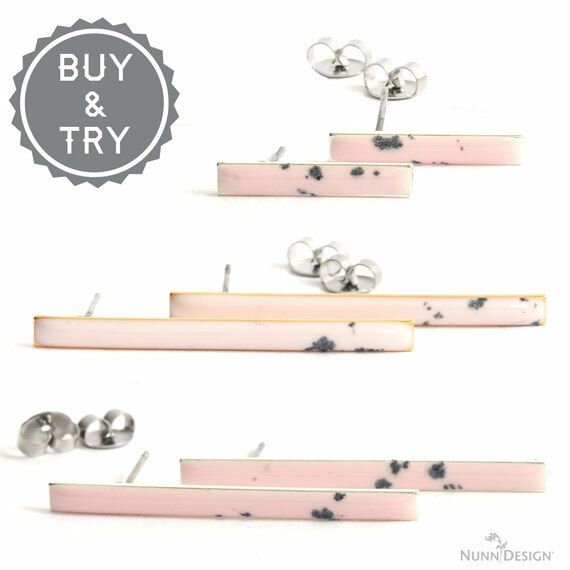 The resin will easily peel away and is fairly easy to pick-off with your fingernails. 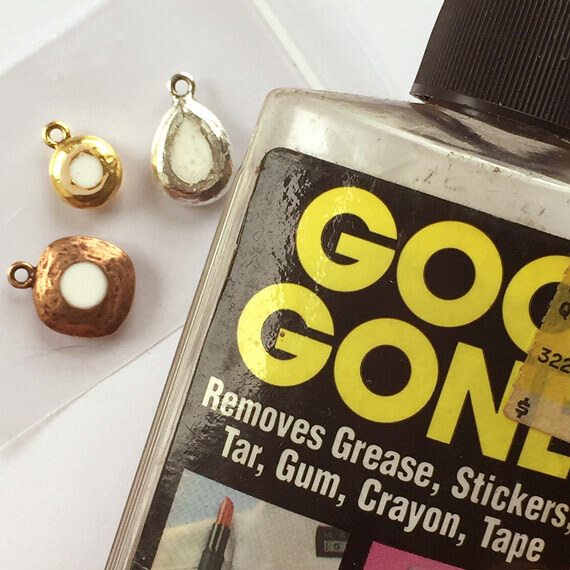 If you have any excess residue from the packing tape on the backside, try Goo Be Gone! Follow the manufacture’s instructions for best results. I applied a couple drops on the backside and let it sit for over a minute. I then used a stir stick to scrape the tapes residue. 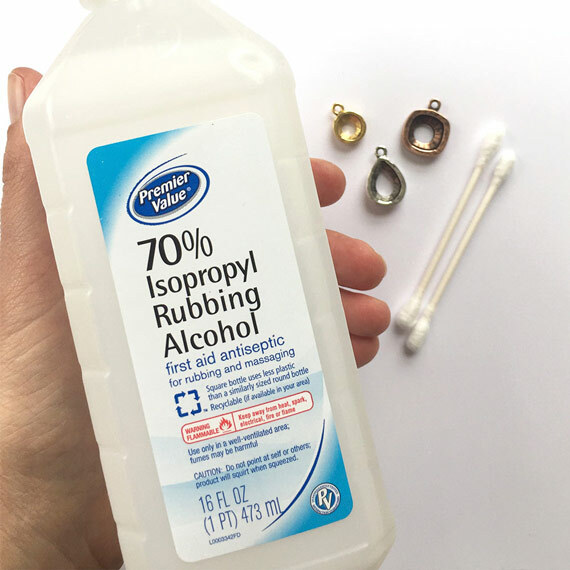 To remove all that sticky mess, pour some rubbing alcohol onto a wet-wipe and wipe it away. Here is the class video where I talk you through the process! 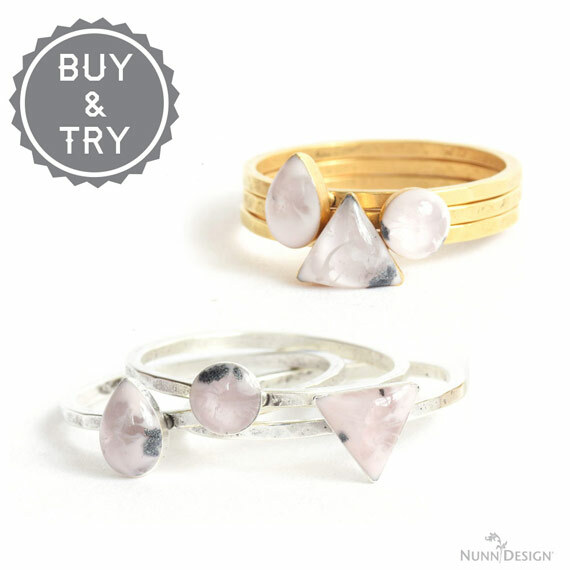 Shop the Buy & Try!